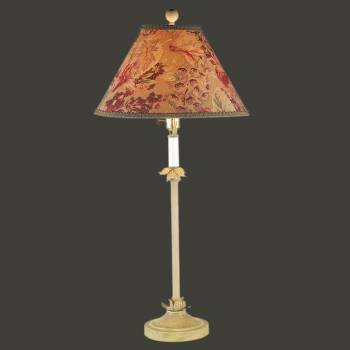 Renovator's Supply's Waverly Accent Table Lamp is fromRenovator's Supply's Waverly Lookout Mountain Collection and has an attractive bronze base topped with a crimson, khaki and sage shade. Measures 28 in. H x 14 1/4 in. W. The shade measures 9 18 in. H. Requires 100 Watt max Type A Bulb.